The Grammy Awards last night were eventful to say the least, as we saw amazing performances from the likes of Miley Cyrus and Shawn Mendes, Diana Ross' grandson give an adorable introduction for the legendary musician, and Drake rudely get cut off mid-acceptance speech. But one of the most talked about moments of the night goes to Cardi B, who won her first Grammy. Cardi's Invasion of Privacy was nominated for Best Rap Album among many talented artists, such as Travis Scott, Pusha T, Nipsey Hussle, and Mac Miller. Cardi was sure to acknowledge the rest of the nominees in her acceptance speech, which was kind of a sweet, nervous wreck, however took time to honor the late Mac specifically in a video posted to Instagram later on. "I read an article that Mac Miller's family said that if he don't win, they want me to win, so I'm sharing this Grammy with you, motherf**ker! Rest in peace," Cardi says in the video below. Cardi also then posted a screenshot of the article to Instagram, which was from US Weekly with the headline, "Mac Miller's Family Is 'Rooting for Cardi B' If He Doesn't Win at the Grammys." The rapper captioned the post, "WE WON A F**KIN GRAMMY." 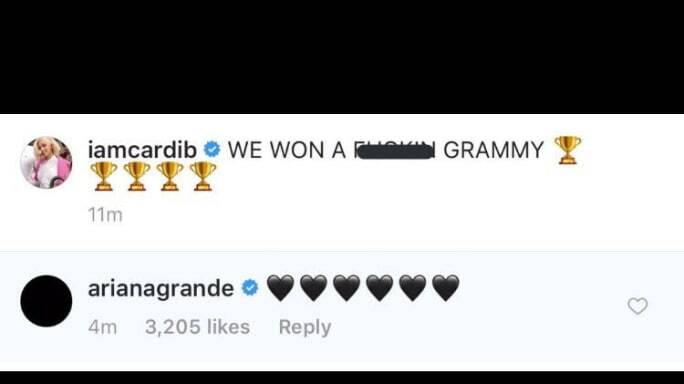 Many took to the comments section to congratulate Cardi and send their support, but the sweetest comment of all came from Ariana Grande. Mac's ex-girlfriend shared love for Cardi on the post, commenting six black heart emojis. Ariana's comment came shortly after she took to Twitter to rant about how angry she was Mac did not win the award. In a series of since-deleted tweets, the singer called the loss "bullsh*t" and "trash." She was then quick to clarify that she was not shading Cardi, but rather upset the Recording Academy even invited Mac's parents to the event, only to see him lose. Ariana Grande apparently went off in a series of since-deleted tweets when Mac Miller lost the Best Rap Album Grammy Award. She then defended herself, stating it had nothing to do with Cardi B personally. Ariana has deleted all of her messages since, only leaving tweets on how grateful she was to have won a Grammy earlier in the night, as Sweetener earned the prize for Best Pop Vocal Album. This marked Ari's first Grammy as well. We appreciate Cardi sharing her win with Mac, as he deserves to be recognized and remembered for a long time to come.